Although any activity involving being out on the water can sometimes be unpredictable and even the most highly skilled skipper and crew can run into trouble, boating is a relatively safe activity. If you’ve taken the time and trouble to learn about the types of things that can go wrong and how to avoid them or to get out of a dangerous situation and in understanding safety procedures and putting them into practice, most boating accidents could probably be avoided. Many of the issues surrounding boating and the hazards and dangers that can cause accidents are discussed in several other articles contained on this website but for the purpose of this article, we will consider some of the more common reasons which result in accidents and how they can easily be avoided. 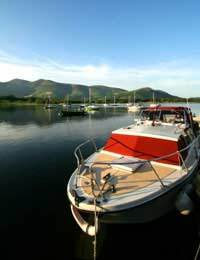 The majority of boats are designed not to sink unless they are severely damaged or are hit by freak weather conditions or because of a serious collision but smaller craft in particular can be prone to capsizing simply because people simply don’t bother to follow the rules or understand what is likely to cause a boat to capsize. Firstly, don’t overload your boat with either too much equipment or too many people. Any boat you live on will have been designed to carry so many passengers and so much equipment in terms of overall weight. It’s important that you find out what the limits are, not to exceed them and to ensure that both people on board as well as equipment are properly distributed in terms of weight proportions to particular areas of the boat, especially if you’re living on a relatively small craft. Many accidents on boats are as the result of falls, slips and trips and most of these could be avoided if people ensured that they wore proper non-slip footwear, cleaned up any spillages and excess water on deck as soon as it occurs, took more time to get around the boat as opposed to rushing about and keeping walkways and access routes clear and unobstructed. If you’re moored up safely for the evening and not intending to move on until the next day, then, of course, it’s perfectly acceptable to have a few drinks and let your hair down a bit if you’re staying on the boat. The problem arises when people have had too much to drink yet are still determined to get from point A to point B. In spite of many boating brochures enticing you by describing the attractions of pulling in to a quayside and enjoying a leisurely pub lunch and maybe a beer or two alongside a river, the simple fact is that boating, water and too much alcohol are simply a bad combination. Not only does too much alcohol fatigue you more whilst driving a boat, your judgement and concentration become impaired in much the same way as they do if you were driving a car, albeit you might be travelling much more slowly. Nevertheless, statistics have consistently shown that alcohol has been the leading contributory factor in a large proportion of boating accidents and has played some part in being one of the main causes of boating fatalities. Many accidents could be avoided if people took the time to take a boat safety course. Many accidents are caused simply by the skipper’s inability to know how to operate a boat safely and the dos and don’ts if a person falls overboard or a boat gets into trouble. Things like the failure to shut down an engine or a propeller in certain situations have been the cause of so many accidents, severe injuries and even fatalities. Other issues where accidents could easily have been prevented include things like poor decision making, especially with regard to setting sail when weather and sea or river conditions are not conducive to travelling, not understanding the rules of the river and boating etiquette and poor judgement which has resulted in a collision either with another vessel or a fixed object. Many of these issues are highlighted in other articles on this website but on a general level, the more prepared you are for any emergency and the more knowledgeable you are about boat safety and dealing with difficult situations when out boating, the far less likely you are to encounter an accident. It’s certainly true that the vast majority of boating accidents could easily have been avoided if people paid more attention to boat safety and the risks that can accompany boating.